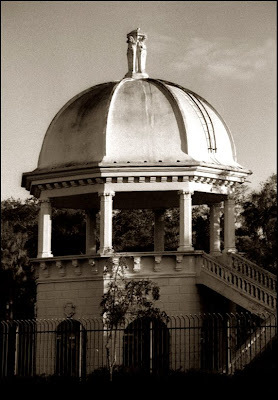 Another image of the gazebo (taken with the diana) and a bit of folklore: There was a young developer living in the 20's named Josiah Richardson who wanted make a name for himself. Josiah could not seem to make any headway in his business endeavors. Failure after failure finally drove him to the point of desperation. Legend tells us that Josiah made a deal with a river demon. Josiah was granted financial success. Josiah built 3 main structures that have stood the test of time: a water tower, the gazebo (pictured above), and his house. All in all, Josiah built a shopping arcade , a waterslide, a hotel, a park, and some housing. According to the legend, Josiah tried getting out of the deal. This brought the spirits' wrath upon him. The river flooded and wiped out all of Josiah's financial assets. The flood also killed many people. Only his water tower, gazebo and house withstood the flood.